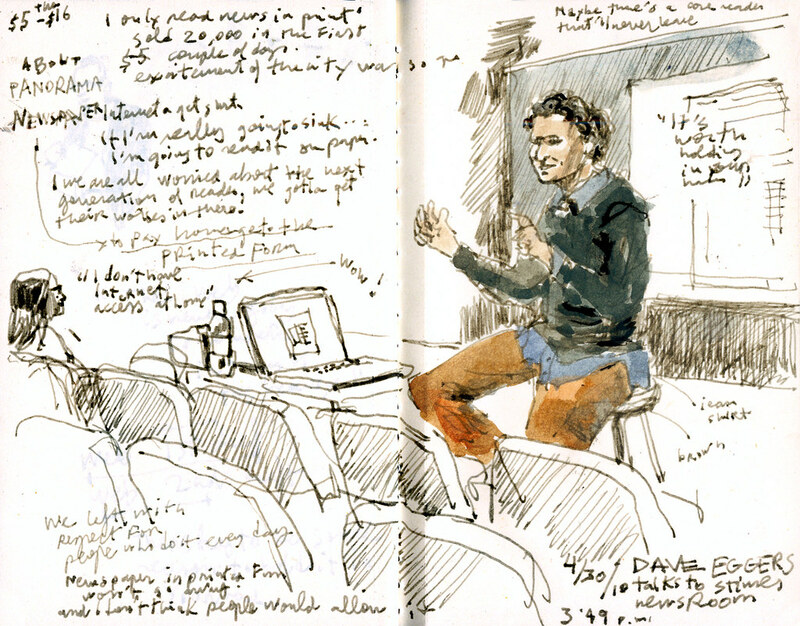 This afternoon, Dave Eggers visited the Seattle Times newsroom. He is best known for his best-selling novel A Heartbreaking Work of Staggering Genius and as founder of McSweenys, an independent publishing house, and 826 Valencia, a literacy project for youth. Invited by our editor Dave Boardman, Eggers spoke to a room full of journalists about Panorama, a 320-page one-day newspaper he published in San Francisco last year as a homage to the printed form. The one-of-a-kind issue is a fabulous compilation of stories, photographs and illustrations that sets a model of what newspapers should aim to be in the 21st century. It was refreshing to hear Eggers talk passionately about newspapers in printed form and see Panorama’s pages full of illustrations, sketches and comics. I don’t know if artists can save newspapers, but we certainly have a lot to contribute! Happy weekend everyone and thanks for following Seattle Sketcher!